Aeroflot Group, Russia’s largest airline consortium, which consists of flag carrier Aeroflot, St Petersburg-based Rossiya Airlines, low-cost carrier (LCC) Pobeda Airlines and far-eastern subsidiary Aurora Airlines, collectively achieved an 8.2 per cent year-on-year growth in the first half of 2018, reaching a total of 24.9 million passengers. This figure represents 48.4 per cent of the passenger traffic generated by Russia’s airlines. The title carrier Aeroflot was accountable for 16.2 million of the passengers, a year-on-year increase of 6.4 per cent. Rossiya’s traffic, which had declined for five consecutive months, started to pick up in June, resulting in an average half-year decrease of 3.8 per cent to 4.75 million passengers. Aurora Airlines, which operates regional flights in Russia’s far eastern region, carried 725,754 passengers in the six-month period, up 5.7 per cent year-on-year. Pobeda’s contribution to the Group’s total in the first half of the year was 12.5 per cent, or 3.1 million passengers. During the period the Group’s passenger load factor decreased by 0.6 p.p. year-on-year to 80 per cent and by 2.3 p.p. to 78 per cent for Aeroflot airline alone. International versus domestic traffic shares varied across the group. Aeroflot carried 8.3 million passengers on its international routes, at a 4.3 per cent year-on-year growth rate, against an 8.7 per cent expansion of domestic traffic to 7.8 million passengers. At the same time, Rossiya saw its international traffic climb by 10.6 per cent to 1.8 million passengers, while its domestic numbers dropped 11 per cent to 2.9 million. 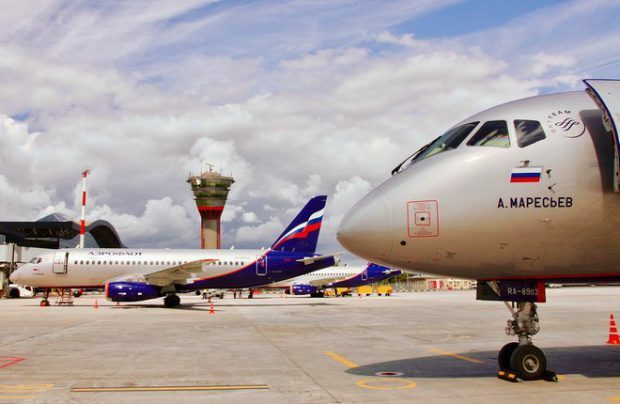 In the month of June, members of the Aeroflot Group collectively carried 5.2 million passengers, a year-on-year increase of 11.4 per cent – “underlining the continuation of the trend of accelerating traffic growth,” the consortium reports. Aeroflot alone was accountable for 3.2 million passengers, a year-on-year increase of 9.6 per cent. Also in June, Aeroflot Group added nine aircraft: two Boeing 777-300ERs, two Airbus А320s, two Boeing 737-800s and three SSJ100s, whilst phasing out two Airbus A320s. As of 30 June 2018, the Group’s total fleet size had grown to 350 aircraft, 241 of them operated by the national carrier.